Marge Thompson will be teaching this adorable Karen Hubbard puppy dog eyes design. If you would prefer to use your own surface, the pattern will be sized for 4" x 6". Basecoat 2 coats of Milk Chocolate. Sand to a smooth finish after the final coat. It would be helpful to have a size 10 filbert rake (comb). Because Marge's printer decided to run out of ink at the most inopportune time, the step-by-step diagram for the eyes is listed here. 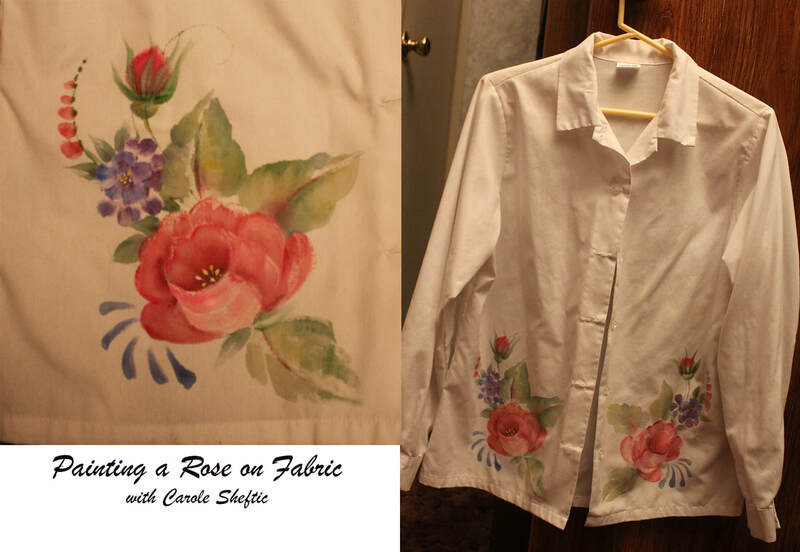 Carole will be teaching this pretty rose on fabric in February. 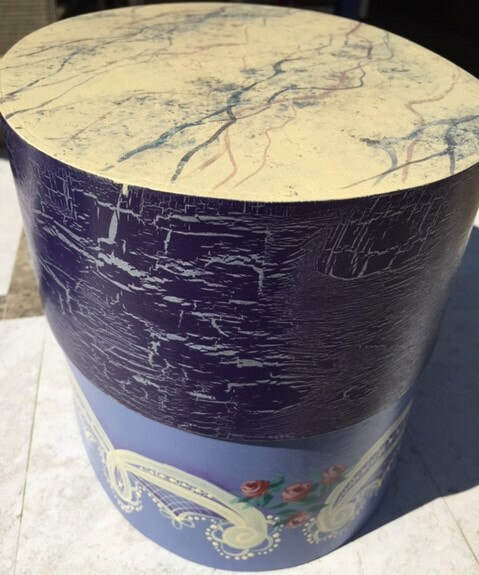 Surface... the project can be painted on any light colored fabric...preferably at least 50% cotton...blouse..vest ...T-shirt..
Cardboard (covered with wax paper) large enough to place behind painted area. Masking tape (or Blue tape) to secure the unpainted areas if doing a shirt etc. and a few safety pins or straight pins may come in handy. ​A hair dryer will come in handy if you have one. Graphite paper if you are working on a thick fabric such as a canvas bag. Kay Wells will be teaching a project that will span March and April. This 2 part project will be a Battenburg Lace box with a marbled top. 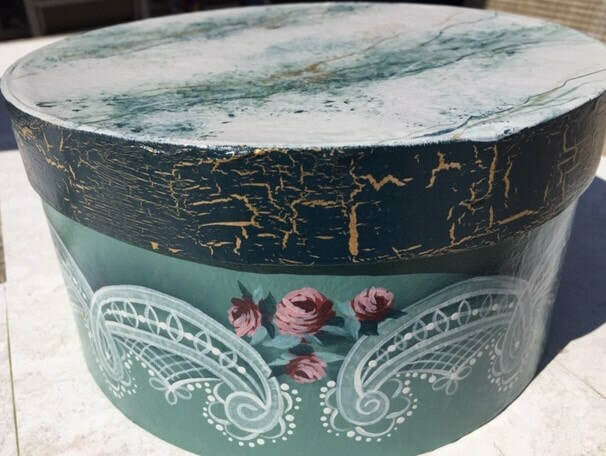 In the March workshop, you will learn how to create a faux marble surface using a variety of colors. You will also learn how to modify a lace pattern to fit the size of your surface. 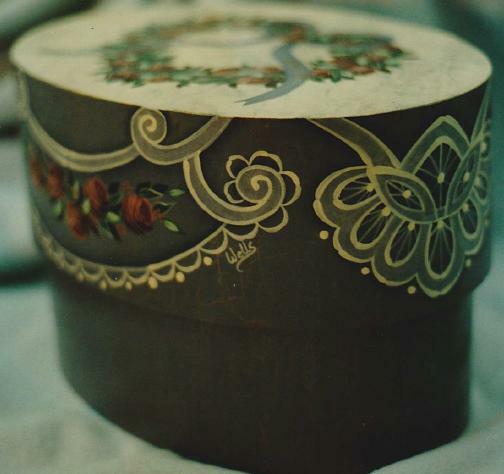 Wood or paper mache boxes are suitable surfaces. 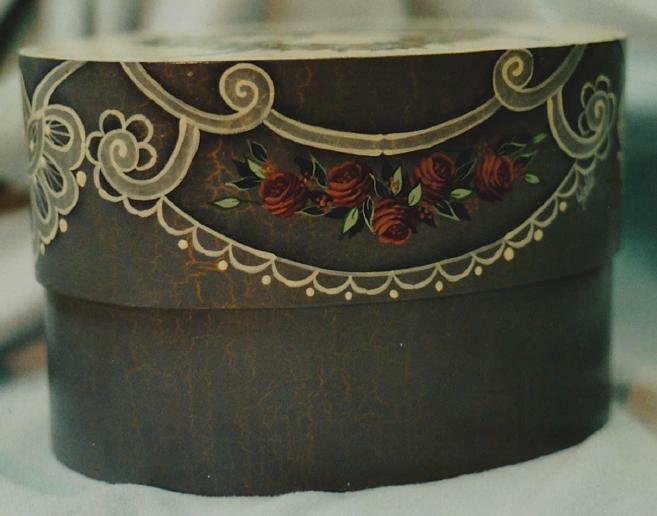 In the April workshop, we will be painting the box including the lace pattern and the nervous roses ala Charles Johnson. Some other boxes of this type are pictured below. 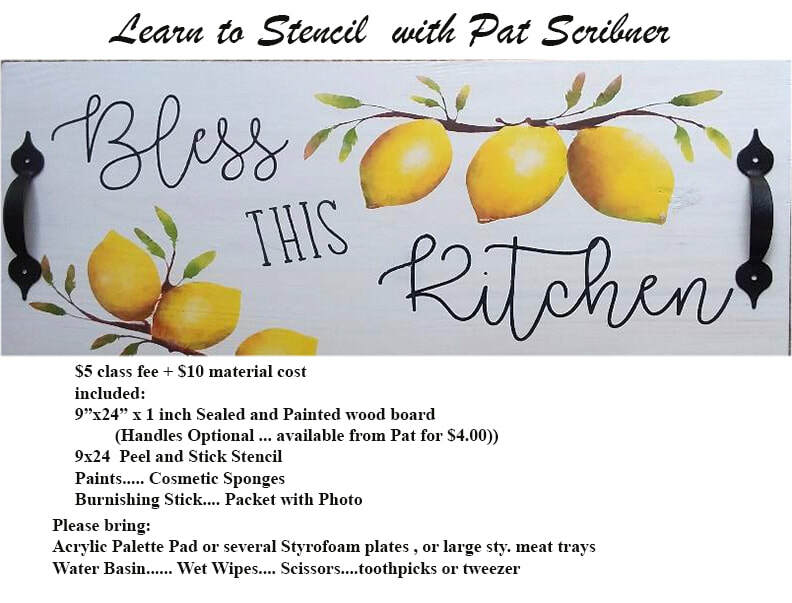 The supplies for March are listed below. For additional supplies needed for April, click on the "April Additional Supplies" button below. Surface of your choice. 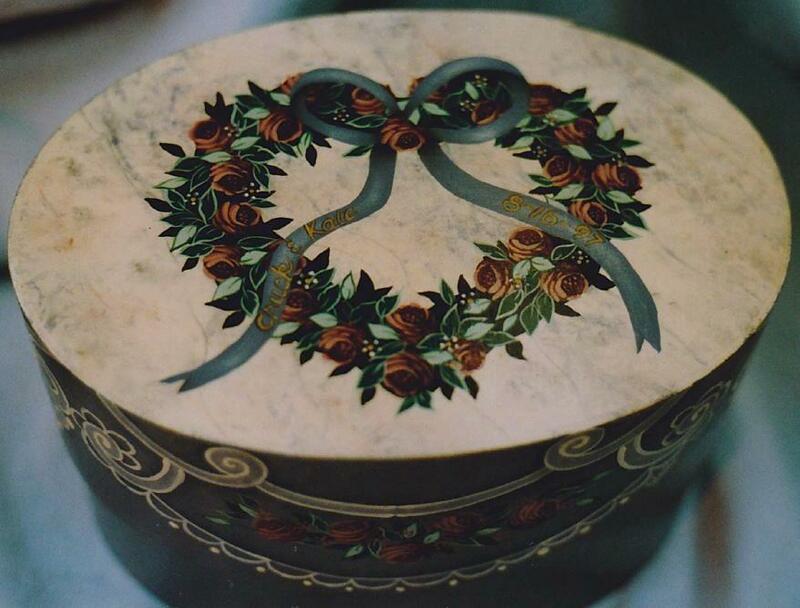 Any type of box whether wood or papier mache will work. If you select a papier mache surface, I suggest sealing it inside and out ahead of class. 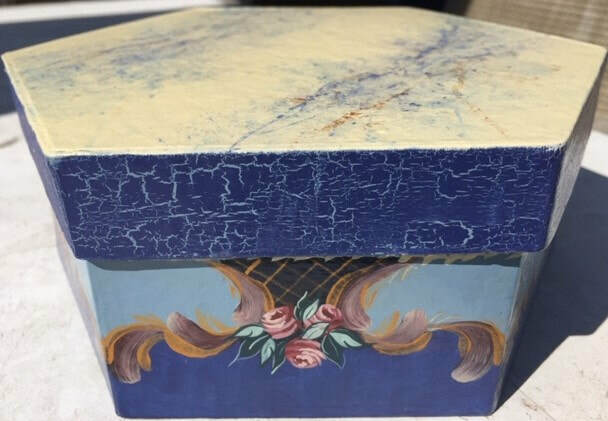 Box colors – 2 colors of your choice. A lighter color for the base of the box and a much darker value for the floats. You will use these colors in the marbled top as well. Lace color – suggest a light color such as Buttermilk or Dove Grey. This will be the base color for the marbled top. Additional color such as gold or silver to include in the marbled top if desired. Large wash brush for wetting the surface to be marbled. Long script liner for making the veins. 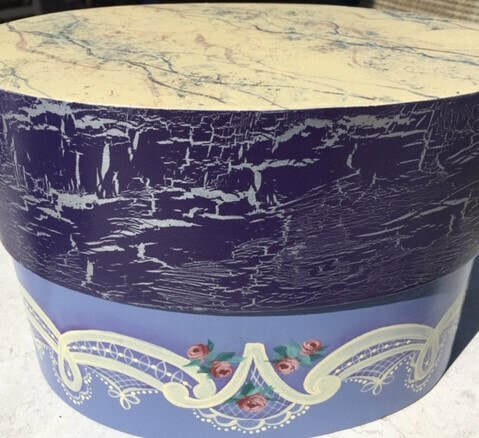 Deli paper or the least absorbent paper towel you can find for applying color to the marble and softening the edges. Hair dryer would be very helpful. Each stage must be dry before moving on to the next color. Crackle medium if you will be crackling the edge of the box lid. Seal your surface. You will be using quite a bit of water for this technique. 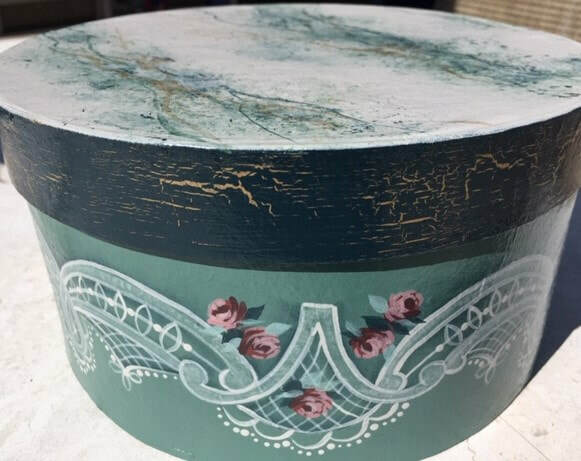 Base the box lid with the same color you will be using for the lace.